We sing to and of a transcendent God. We cannot fully understand who he is or what he does. And it’s not easy to understand our relationship with him. We have his Word which is a start. How do the biblical authors help communicate the mysteries of the God we worship? This is because metaphors are the best tools for dealing with complexity and mystery. In Isaiah 64:6 God is the potter and we are the clay. God is compared to a hen in Psalm 91:4. And in Isaiah 42:14, to a woman in childbirth. Even Jesus Christ, wholly God, used metaphors to explain who he was. “I am the vine; you are the branches” (John 15:5). Most of life is mysterious and complex. Most things cannot be expressed or understood directly or simply. In order to express what is inexpressible, and explore the unknowable, we make comparisons to familiar things. But metaphors do more than help us explain and understand things. In the hands of a skilled poet, they activate our imaginations. Before we get into some examples, we need to get some of the technical explanation out of the way. This is very important, for if you don’t make the comparisons correctly, they will be ludicrous, not magical. A metaphor has two parts: the thing you are describing (A) and the familiar thing you are comparing it to (B). In the metaphor, “The wind howled,” the wind (A) is compared to wolves (B). Note that you can name or imply either part of the comparison. In this case, A is named and B is implied. Just a few other related terms, that you probably remember from high school. A simile is a comparison, but it is indirect, usually using the words “like” or “as”: “The wind sounded like the howling of a wolf.” Personification is a type of metaphor when B is a person–“The wind whispered through the leaves.” The term metaphor can be used to refer to the general category that includes the metaphor proper, as well as simile and personification. I’ve only sung Needtobreath’s “Multiplied” one time, and it was memorable for all the wrong reasons. I remember it because of the problems with metaphor. In this verse, we have God’s love (A) being compared to “diamonds bursting inside us” (B). It makes sense to compare God’s love with something as beautiful, multifaceted and long-lasting as a diamond. It also makes sense to compare the feeling of being loved by God as a “bursting” sensation. But it doesn’t make sense to compare anything to a bursting diamond, because that’s not what diamonds do. In the last line has a similar problem: “blazing wildfires” don’t sing. Chris Tomlin’s “Amazing Grace: My Chains Are Gone” is a more well-known example of the problem of the mixed metaphor. If you don’t get these metaphor basics right, you might write lyrics that lead to confusion rather than to worship. When metaphors are done correctly, they can be magic. As with all great poetry, there is so much more going on here than metaphor, but the metaphors are wonderful. In line two, the sound of the ocean turns into a roar, which suggests a lion, and in line 11 the tone is “sinister.” In line four, the door is “restive,” meaning it’s unable to keep still–like a person, so it is personification. There is more personification in the “sombre” clouds. All these suggest turmoil within the speaker and the suggestion of danger. The threat increases as the leaves are metaphorically compared to a snake in lines 9-10. When the stormy conditions are described metaphorically, we can imaginatively understand the complex feeling the speaker is experiencing–it is a particular kind of loneliness–a loneliness mixed with profound fear. We experience it a little ourselves. When we understand his feeling, we understand the final line. I’ve written previously about the wonderful metaphors used by Katheryn Scott in “At the Foot of the Cross.” Scott’s metaphors are great examples of how to effectively use standard comparisons that lead into deeper worship. “My Lighthouse” from Rend Collective Experiment employs an extended metaphor, a comparison that is extended through the whole song. Sometimes our life is like a “troubled sea.” Notice that the troubles aren’t general and abstract. They are of a particular kind of trouble; they are not in the categories of lost car keys or bankruptcy and divorce. It is not these trials that stir up the waves; it is a lack of trust. The forces behind these turbulent waters are my wrestling, doubts, questions, failures, and God’s silence–a lack of trust in God. The metaphor invites us to look beyond our troubles to the one we can trust to take us through them–to the lighthouse. Lighthouses have two functions: to warn ships of danger and to guide them to safe harbour. Remembering God’s promises will shift our focus from the dangers of doubt, and they will guide us “safe to shore.” Christ and his promises a guiding light when we are on the dark and stormy seas, when we struggle with trusting God. The metaphor doesn’t simply tell us that we can trust in God in our troubles, it places us on a boat, caught in a storm off of the coast (of Ireland I imagine) and it shows us a lighthouse through driving wind and rain. 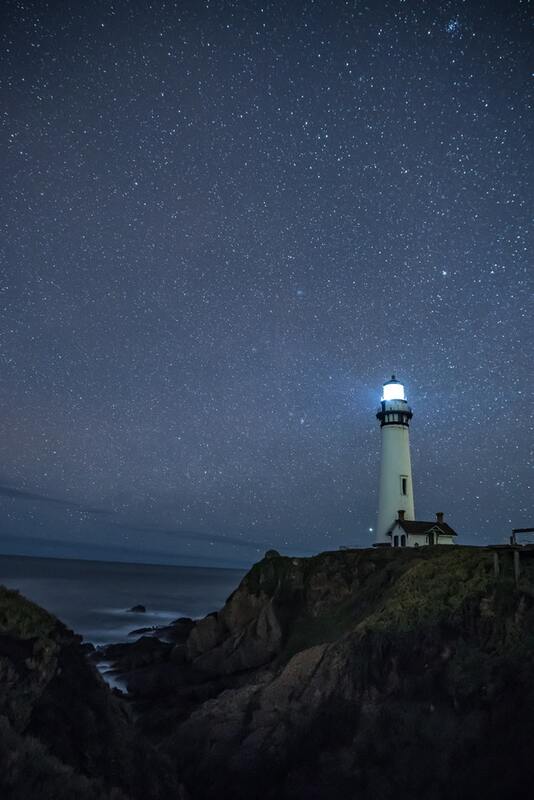 We can trust the lighthouse to guide us. And then, as we sing, we discover we will be all right, not by our own strength, but by looking to him. That is the magic of metaphor.